We are proud to introduce our new line of low priced tear-off shovels! 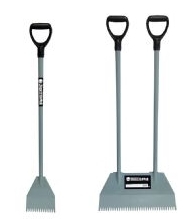 These shingle removers are economically priced, light weight and handle great! Get the details of both models below. This shingle remover is simple and strong – it will get just about any job done! The lightweight design (5 pounds) makes handling a breeze. Shop your Jack the Ripper shovel today! This innovative shovel is a DOUBLE shingle remover which will make your work much more efficient. The tear-off shovel has a 20 inch serrated blade which will remove huge amounts of shingles cutting work time dramatically. Shop the Double Dipper shovel today! If you think these shovels will help you in your next roofing job (and they will), take a closer look at what these shingle removers have to offer. You can buy these securely online right here!